Happy Birthday to US!!! This year the blog is celebrating six years. Six years of recipes, of stories, of photographs, of sharing. We thought this was the perfect time to share this recipe. A real favorite of ours. We first got the idea from our friend Michal, who makes the most perfect layered version of this cake. We like to do things a little easier, and when you make a cake for your own birthday you want it to look good and taste good, but who really has the time to put so much energy into a layered cake. 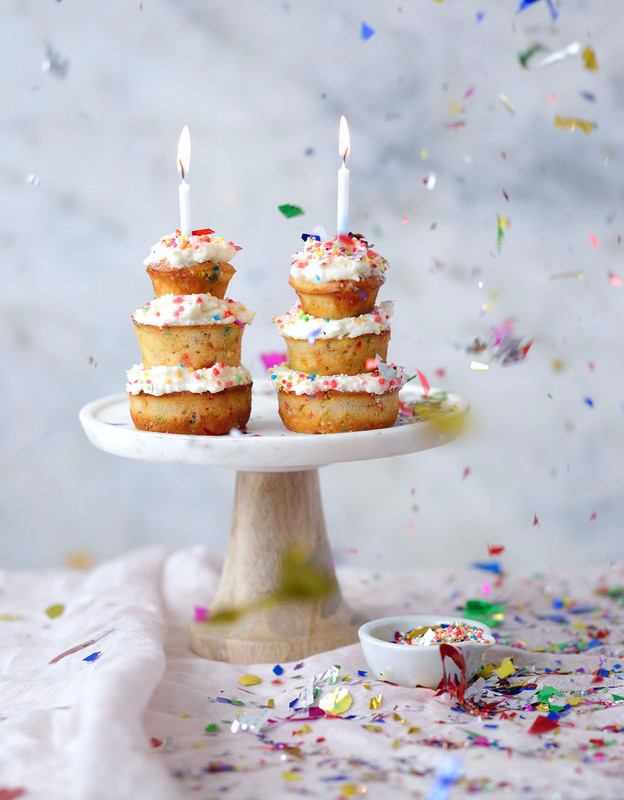 So we made these confetti cupcakes, which are the perfect way to celebrate a birthday. Especially your own. *Now is the perfect time to say thank-you. To everyone who has read our posts, commented on them, shared them, tried them, ate them. We love what we do and we really wouldn’t be able to do it without knowing there are those out there listening to us and trying our recipes. We gave the recipe here for our favorite way of serving them- as cupcakes, but you can just easily make this recipe into one whole cake. And we served these with vanilla frosting, but you can make any of your favorite frosting (cream cheese, buttercream) or even just top with some fresh whipped cream. Preheat oven to 180F/350C. Prepare a muffin tin with cupcake liners. In a mixer fitted with a paddle attachment, mix the butter and sugar for 2 minutes on medium speed. Gradually add the oil while mixing. Add the vanilla and then the eggs, one at a time, until combined. Mix in the flour and sour cream, alternating between the two while adding gradually. Remove from mixer and add the colored sprinkles and fold them in using a rubber spatula. Pour batter into prepared muffin tin. Bake for 15-20 minutes, until a toothpick placed in the center comes out clean. 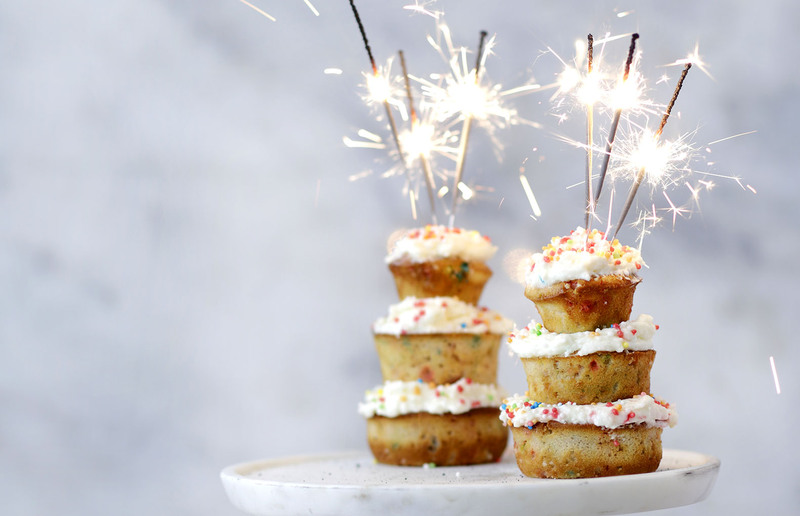 Once the cupcakes have cooled, top them with frosting of your choice and sprinkle with more colored sprinkles.